Soaker Hose: "Yellow Stripe" 100' x .580 (3/8" ID) soaker hose offers the perfect delivery of water to plants. 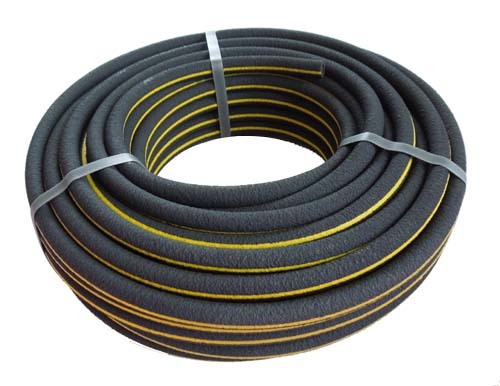 "Yellow Stripe" 100' .580 OD x 3/8" ID Bulk Soaker Hose offers the perfect delivery of water to plants. Made from recycled materials, 70% from recycled rubber and 30% recycled polyethylene products that are re-pelletized for use in the process. Bulk Soaker hose means there are NO fittings on the hose. In turn, you can cut to desired lengths to create your own custom system. 580 Soaker Hose can be run in lengths of up to 100', but not to exceed 500' from one water supply. GPH is approx. 81 gallons per hour, per 100' at 25 psi, depending on inlet pressure, water hardness. Soaker Hose uses the Black and Yellow compression fittings. Hose should be used on flat surfaces not exceeding a 2' rise over 100'. A pressure regulator is a MUST since soaker hose is designed to work at low pressure. Don't confuse OD sizes in soaker hose and drip. .580 soaker hose IS NOT the same as 5/8" hose, 5/8" would be .625. When you see 5/8" hose in a store, that is measured inside diameter not outside diameter. Some fitting sizes are marked on the tip of the fitting. Black and Yellow fittings always fit the 580 hose and the old Fiskars brand hose.